Western blot analysis of extracts from Hela cells treated with serum using BTK (phospho-Tyr223) Antibody.The lane on the right is treated with the antigen-specific peptide. Immunogen Peptide sequence around phosphorylation site of tyrosine 223 (A-L-Y(p)-D-Y) derived from Human BTK. 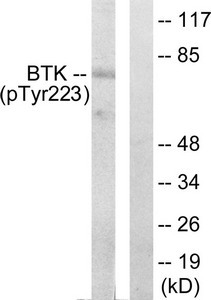 Specificity The antibody detects endogenous levels of BTK only when phosphorylated at tyrosine 223. Non-receptor tyrosine kinase indispensable for B lymphocyte development, differentiation and signaling. Binding of antigen to the B-cell antigen receptor (BCR) triggers signaling that ultimately leads to B-cell activation. After BCR engagement and activation at the plasma membrane, phosphorylates PLCG2 at several sites, igniting the downstream signaling pathway through calcium mobilization, followed by activation of the protein kinase C (PKC) family members. PLCG2 phosphorylation is performed in close cooperation with the adapter protein B-cell linker protein BLNK. Sulekha Verma, J. Biol. Chem., Feb 2001; 276: 4671 - 4676. Yan M. Li, Cancer Res., Nov 2003; 63: 7630 - 7633. Malti Nikrad, Mol. Cancer Ther., Mar 2005; 4: 443 - 449. Feng Dong, Infect. Immun., Mar 2005; 73: 1861 - 1864. Function Non-receptor tyrosine kinase indispensable for B lymphocyte development, differentiation and signaling. Binding of antigen to the B-cell antigen receptor (BCR) triggers signaling that ultimately leads to B-cell activation. After BCR engagement and activation at the plasma membrane, phosphorylates PLCG2 at several sites, igniting the downstream signaling pathway through calcium mobilization, followed by activation of the protein kinase C (PKC) family members. 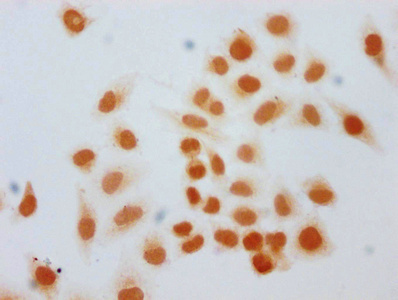 PLCG2 phosphorylation is performed in close cooperation with the adapter protein B-cell linker protein BLNK. BTK acts as a platform to bring together a diverse array of signaling proteins and is implicated in cytokine receptor signaling pathways. Plays an important role in the function of immune cells of innate as well as adaptive immunity, as a component of the Toll-like receptors (TLR) pathway. The TLR pathway acts as a primary surveillance system for the detection of pathogens and are crucial to the activation of host defense. 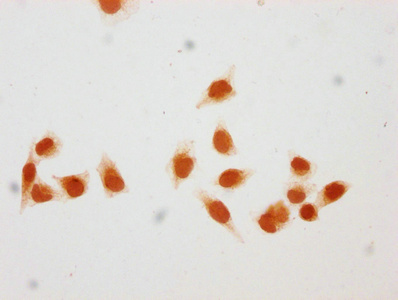 Especially, is a critical molecule in regulating TLR9 activation in splenic B-cells. Within the TLR pathway, induces tyrosine phosphorylation of TIRAP which leads to TIRAP degradation. BTK plays also a critical role in transcription regulation. 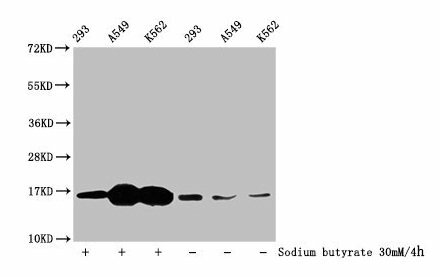 Induces the activity of NF-kappa-B, which is involved in regulating the expression of hundreds of genes. BTK is involved on the signaling pathway linking TLR8 and TLR9 to NF-kappa-B. Transiently phosphorylates transcription factor GTF2I on tyrosine residues in response to BCR. GTF2I then translocates to the nucleus to bind regulatory enhancer elements to modulate gene expression. 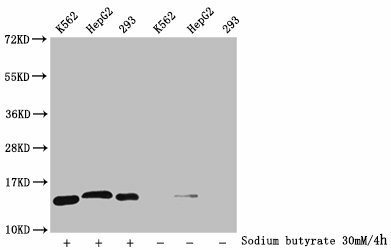 ARID3A and NFAT are other transcriptional target of BTK. 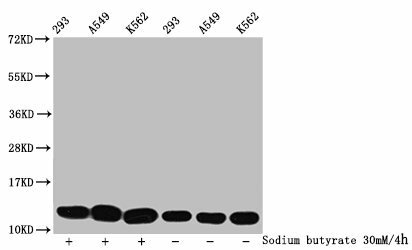 BTK is required for the formation of functional ARID3A DNA-binding complexes. There is however no evidence that BTK itself binds directly to DNA. 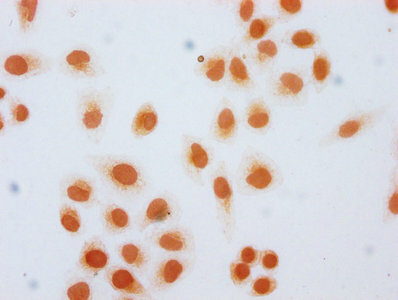 BTK has a dual role in the regulation of apoptosis. 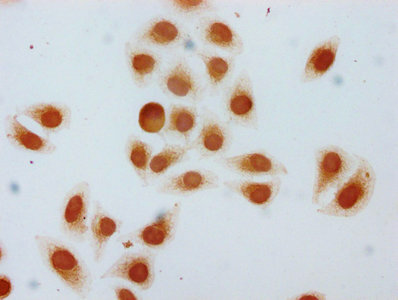 Tissue Specificity Predominantly expressed in B-lymphocytes.